The Adobe Photoshop Lightroom Classic installation process is not difficult, but unfortunately the program that you will downloaded from adobe.com provides minimal instruction. This lack of guidance often creates unnecessary confusion for brand new Adobe Photoshop Lightroom Classic users. Unlike some other software programs, there are multiple steps involved in the Photoshop Lightroom installation process. This tutorial is intended for brand new Adobe Photoshop Lightroom users who need help installing Adobe Photoshop Lightroom Classic only. Please go to this tutorial instead if you are a currently an Adobe Photoshop Lightroom user looking for advice on How To Upgrade To Adobe Photoshop Lightroom Classic or to this tutorial on How To Install Adobe Photoshop Lightroom 6 if you are looking to install the older standalone version of this powerful software. 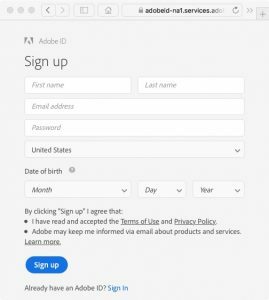 Before you can install Adobe Photoshop Lightroom Classic you must create an Adobe ID at adobe.com. The username and password that you register here are important. Be sure that you write down your new username and password! You will need to enter these details in again before you can proceed with the installation process. Now it is time to let the Adobe Photoshop Lightroom Classic installer do its thing. At the end of the installation process, the Adobe Creative Cloud installer will automatically create a new Adobe Photoshop Lightroom Catalog for you. Your Lightroom Catalog is a database that indexes your photos. Your Lightroom Catalog allows you to organize thousands of digital images thanks to Lightroom’s robust search tools and other organizational features. At first, your Lightroom Catalog will be blank but that will change as soon you begin to add images into this index. The upgrade process is not complete until you set up your Adobe Photoshop Lightroom Preferences. Preferences are not exciting stuff but you can avoid so many of the common Lightroom pitfalls if you take the time to change a couple of important settings before you do anything else with this software. Congratulations! You are now ready to begin using Adobe Photoshop Lightroom Classic. This would be a great time to become a FocusPhotoSchool.com subscriber to unlock our complete Adobe Photoshop Lightroom video training course.